At which point does the installer stall? (in the beginning, during download or during install) and at this point LVM installation doesn’t work, so just avoid it for now. You did partition the disk the right way, so there’s nothing wrong in that area. You can use e.g. pastebin to store the logs and show the URL here. half of the space is more than enough. Thanks for the logs, they help a lot! In your ghostbin output the 2TB disk did not have a valid partition. The 3TB disk seemed to have a valid partition. 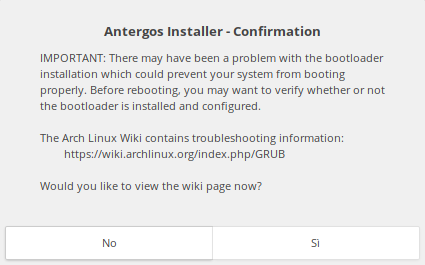 and do NOT try to install to the USB stick (the stick has iso9660 fstype and label ANTERGOS). Be sure to select correct drives and create good partitions (ext4 is recommended) for root and home. And don’t forget to create a small fat32 partition for EFI (if installing for UEFI support). You can create partitions while installing, you do not have to use gparted for that. Why do you want to create a swapfile, you’ve already created a swap partition. Yeah, I noticed the swap partition. Either way, it may work now. It looks very good by now, but let’s keep our fingers crossed. As @Bryanpwo noted, you don’t have to create a swap file as you have a swap partition. You can reinstall grub from the live iso, you don’t have to reinstall. After that you can close the live environment and boot the system. Hmmmmm…to make it more 2019!?! Very odd choice. From the logs it is obvious that the bootloader couldn’t install. Is it possible that you didn’t make the EFI partition mount point to /boot/efi? But anyway, you probably can install the bootloader separately, according to instructions by @Bryanpwo. Just make sure the device partitions are correct. That sounds really strange! Cannot be possible?